Continuing an MRRC holiday tradition, the 41st annual MRRC Christmas Party and club meeting will be held on Saturday, January 19, 2019 at 1500 Danner Drive Aurora OH 44202. That same weekend, MRRCers are also invited to the K8AZ Open House/NCC Christmas Party with our colleagues from the North Coast Contesters. NCC members are also invited to join us in Aurora. This year the MRRC party is again being held BEFORE the K8AZ open house. This was a request by many members to try and limit late night winter driving in the snow belt and making this a day trip. The MRRC party begins at 2:00PM on 20-Jan 2018 and runs until roughly 3:30PM. We’ll make arrangements for soft drinks and snacks. Besides general socializing, there will be a short MRRC business meeting to discuss topics relative to MRRC and the Dayton Hamvention annual meeting. Nothing will be voted on in Aurora – any discussion is just to learn the membership thinking on certain topics relative to the club. After the meeting members are encouraged to continue the festivities at the K8AZ open house. 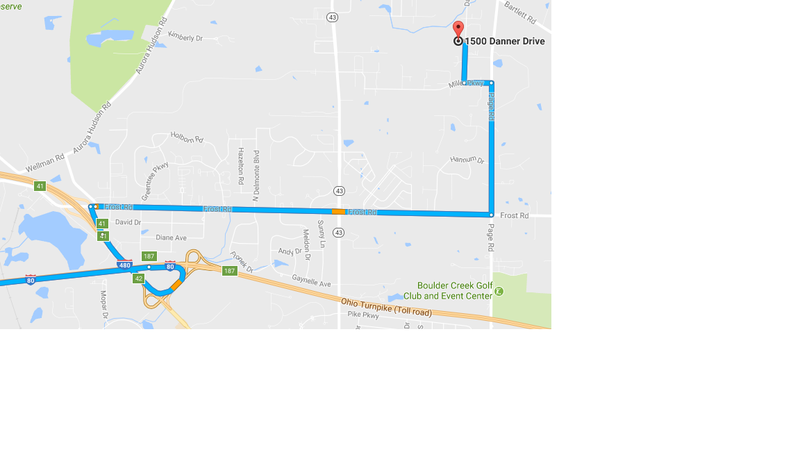 To get to the MRRC Party from the west take I80 to exit 187 (I480/OH14 West to Cleveland), take exit 41 Frost Road to Page Road to Miller Parkway to Danner. The company is named LayerZero Power Systems, Inc. and there is a white sign on the front lawn. The building is a dark brick, modern looking building with many windows. The most straight forward way to approach the plant is from SR 43. Go east on Lena Dr then turn right on Danner Dr. LayerZero is on the west side of the street. The driveway is on the north side of the building. There is plenty of parking. To get to K8AZ, exit I-271 at exit 36 for Wilson Mills Road east and follow it until it dead ends. Turn right on Chagrin River Road and proceed for about ¼ mile to the first road on the left (Brigham Road). Turn left, then follow it up the hill and across County Line Road, then proceed another ½ mile to Surrey Lane on the right (watch for a “Deer Crossing” sign). Turn right and follow it to K8AZ. K8CC plans to leave the Detroit metro area Saturday morning to drive down to Cleveland for the parties, and invites any Michigan MRRCers to join him. Space IS available if you wish to ride along, or you can caravan down in your own vehicle. Contact Dave, K8CC at comcast.net for more information.